Northern Kentucky Montessori Academy: Never Ever Give Up on a Dream! Never! Never giving up on its dream of a new and expanded facility, Northern Kentucky Montessori Academy gathered its forces to reassess the feasibility of a capital project in earnest. As such, KSC was invited in April 2018 to facilitate a project-centered retreat with the school’s Board and project consultants. The session was designed to tap into the wisdom of the crowd by determining the most cost effective and timely way forward. Focusing on the school’s key capacities to assess readiness for a Capital Project—Leadership, Administrative, Community, Giving, and Fiscal, the group worked to identify persistent obstacles and current solutions to progress. In addition, considerable attention was given to introducing a project path as well as project models and success stories that provide perspective and inspiration. NKMA and KSC continue to move the feasibility studies forward while simultaneously sowing the seeds of a Campaign leadership effort. The Center School has a good problem: It is growing! But it is presently housed in two aging and inflexible buildings. As a result, its current facilities can no longer serve the highest and best needs of students and staff. In search of solution, the Center School’s Board of Trustees asked KSC to conduct an extensive feasibility study to assess the school’s programming needs as well as the core capacities needed to conduct a successful Capital Project—financial, leadership, administrative, giving, and community. KSC has now been retained as Project Coordinator to guide the school through all facets of a $10.0 million relocation and redevelopment—funding, permitting, design, and construction, as well as the acquisition of an ideal site to accommodate 25,000sf of new classroom, administrative, and community space. 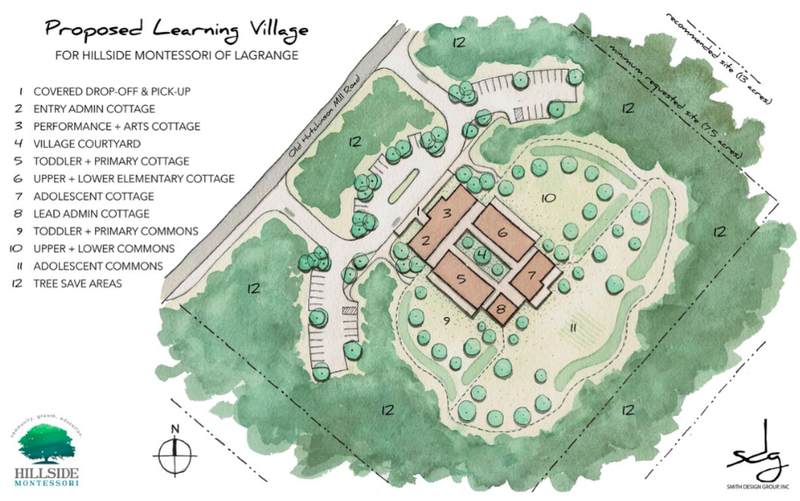 What began in spring 2014 as a pressing need to address the deteriorating condition of a single structure on Greenspring’s historic campus evolved into the creation and execution of an inspiring master planned initiative in support of its entire Montessori learning community. KSC has now guided the first two elements of Greenspring’s three-phase master plan to completion. Phase 1, the Toddler & Children’s House Village East, was completed in November 2018. And in June 2018, the school christened a second Toddler & Children’s House Village. A combination of new construction and total renovation has transformed the turn of the century structures into state of the art, fully prepared Montessori learning and working environments. The outcome is a gift of 30,000sf of new classroom, administrative, library, learning support communal, and outdoor environments, in addition to the redevelopment of its Montessori Teacher Training Center. The planned final phase is the 5,500sf Elementary Village. In its role as Project Coordinator KSC is responsible for oversight of project permitting, design, financing, construction and the Capital Campaign. KSC's Kevin Campbell was a presenter at the recent 2018 American Montessori Annual Conference in Denver, CO. The topic, "The Montessori Capital Project: A Path to Stability, Sustainability, and Maturity", was well attended by administrators, trustees, and even a few guides from schools across the nation. The vast majority of attendees were either actively engaged in a Capital Project / Capital Campaign at some point in the lengthy process or contemplating one in their future--an encouraging sign when it comes to Montessori growth. If you were unable to attend the conference, but have a Capital Project on your mind, here is Kevin’s presentation to help you on your way. All questions or inquiries pertaining to the ideas shared therein are welcome. Please feel free to reach out to Kevin directly at ksceduconsulting@gmail.com. KSC's Kevin Campbell will be presenting at this year's conference. The workshop, titled "The Capital Project: A Path to Institutional Maturity, Stability and Sustainability," explores how a school can remedy the tension between facilities-driven operational challenges and its greater aspirations and, as a result, open pathways to growth, stability, and sustainability. KSC has provided The Common School with ongoing Capital Project and Campaign support over the past year and has now been formally retained to guide the school's $1.0 million 50th Anniversary Fund: a comprehensive campaign designed to deliver the school's Campus Revitalization Plan to a summer 2018 groundbreaking. Having completed an extensive capital project feasibility study for GCS in spring 2017, KSC has now been retained to guide the school into a deeper exploration of fundraising, financing, site evaluation and site planning. As part of its ongoing support for MSCVT, KSC will facilitate a strategic planning retreat for the school's Board of Trustees in late October. KSC is pleased to announce that Phase 1 of Greenspring's three phase Master Campus Planned Capital Project will be ready for occupancy in early November 2017. The 10,500 sf of combined new construction and renovation will be home to seven Toddler (ages 1.5 - 3) and Children House (ages 3 - 6) classrooms, in addition to a community kitchen, administrative offices and meeting space. KSC has been fully responsible for coordination of design, financing, fundraising, and construction for the $4.0 million initial phase.